This will shrink the source of Office 2K3, XP, and 2K! You can cancel the script at anytime by pressing 'CTRL ALT X'. Run this on a clean install of Windows. It should go throught the office install process and copy every file that is needed. You will see it working. 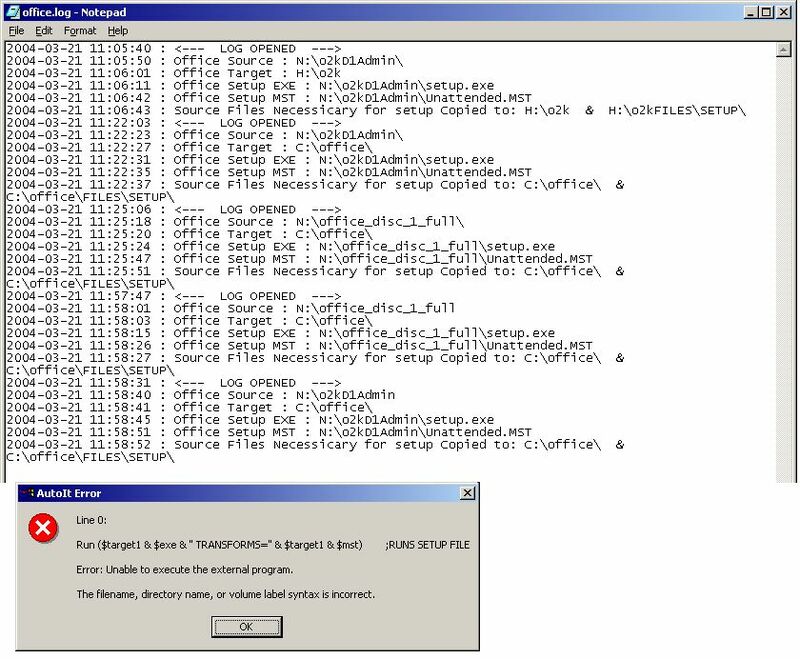 There will be an error box for each file that is being copied, this is normal. It should stop for everybody. Or here is a super guide with a detailed explanation! For me mate, it wouldn't even start. 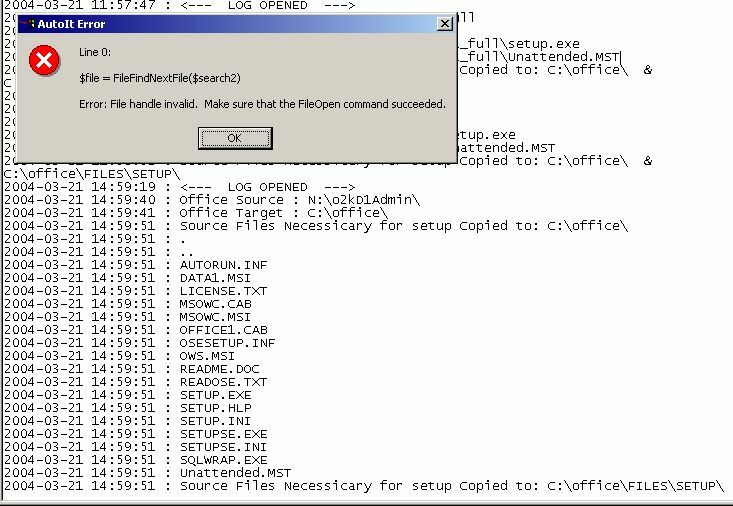 Its lookin for setuppls.exe, but my copy has pro11.msi, and it won't except the unattended script. error:Unable to execute the external program. afaik setuppls.exe is the new setup for admin installs. do you have a setup.exe file any exe file in the root of your cd. change setuppls.exe to whatever that exe file is. i think it is called officepro.exe but i really dont know since i dont have office 2k3. try that and let me know. also send me the log after you try that. 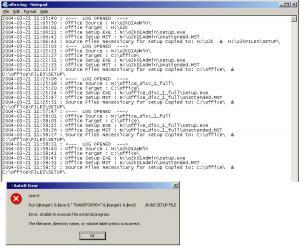 @ghost: When you run an unattended install of office what is your command? That is where the problem is. Send it to me and ill see what i have differently in the code. Anybody else having a problem getting it startted? ***on a side not I just realize this thread was about office 2003 (go me) but anywho shouldn't it still work with o2k? @FlyorDIE: well kindof... i have never tested on o2k. the problem it that the setup should have atleast started that has nothing to do with the different versions. I am trying to figure out where im going wrong with the startup code. i am in the process of rewriting the file selection portion of this. So when i get that finished i will just release that part to se if i fixed the problem. Ok this is just to test the new input portion of the code. So run it and let me know of any problems or errors. i also fixed some logging things so that i will better be able to diagnose why it is not runnign for some people. Just run it and the office setup should start. If this works then i will move on to what you are all here for. So let me know since i cant test it right now. i wont be able to test anything myself for about a week so your input is appreciated. Heres the results from running it. I hope it helps. So... give me a sec and ill implement the other portion of the code. HAHA about the second page....that is what i figured since you were in here and not doing anything. I updated the first post too but i am assuming that you were looking for a reply after yours. OH well..
ok here it is... keep in mind that i have never tested this with o2k so... i have no idea if this process will even work for it.